Visitor Records: After you install this module successfully, you can click "Analysis Record" button and enter "Analysis Record" page. Here, you can check record of each user's visit including IP, name, Platform, Browser,Url Referrer, Country, Enter Date, Visit Page Count and so on info. You can click one certain record and go to check detail info of users' visting page. In addition, you can also delete one certain record here. Moreover, you can check the record according to chosen scope such as 1day, 7days, 1month, 3months, 6months, 1year or all records. Analytics Chart: After you click "Analytics Chart", you will see four kinds of analysis charts. They are "UrlReferrer Chart", "Pie Chart", "Table Chart", "Line Chart" and "Geo Chart". You can check visit count of each page, national distribution quantity of visitors and Line Chart for visit count during one certain time interval. You can check status of your website intuitively here. Online Visitors: After clicking "Online Visitors", you will see which persons are visiting your site now and you can also see which page they are visiting. Flow Chart: Here it records detail info of users' visting page, then you can see which pages this visitor visits and how much time he/she stays on each page. 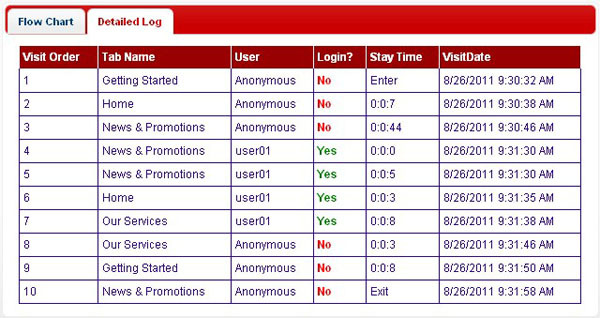 Besides, it can also record when this visitor enters and leaves this page, state of login and logout. It can display visit route of this vistior' visiting very intuitively. 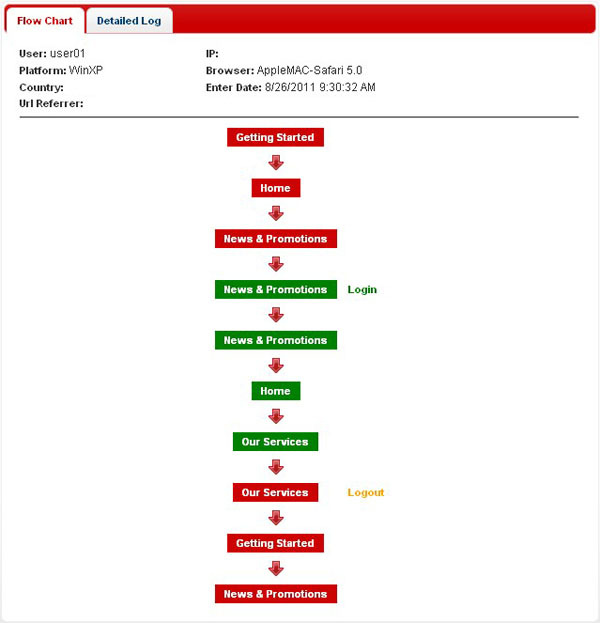 Detailed Log: It records detail info of user's visting page here and displaying content is almost the same with Flow Chart page. But it displays with log format here. 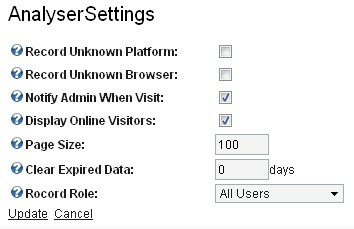 Analyser Settings : You can configure page size of "Visitor Records" list here and define how many days to control whether to delete expired records. If you configure the day to be 30, then system will only save all records within 30 days and it will delete all past datas. If you configure it to be 0, then it will never delete datas. Email Notify: When you check option "Notify Admin When Visit" on "Analyser Settings" page, it will send one email to admin after users visit your site. Added search function, you can search visitors according to displayname, username, firstname, lastname, email. User Email can display on Vistor Records page. Added the feature of exporting visitor records as csv. I optimized the module performance, operation and interface. I added "Enter Page" field on "Visitor Records" page, this will help you conveniently view which page users visit for the first time. Page Name can display in Email now. When you get visit email, you can quickly view which page users visit for the first time. Added "Anonymous" in "Record Role" option, it's used to record only anonymous users. Added "UrlReferrer Chart". In this way, admin can clearly know visitors access your site from which address. Added email alert feature. When users access your site, it will send one email to admin. Added option "Display Online Visitors" which is used to control whether to enable the feature of displaying online visitors. Added options "Record Unknown Platform", "Record Unknow Browser" to filter some invalid access data. Added "Record Role" option, you can configure it to record only which role. Add four kinds of analysis charts. They are "Pie Chart","Table Chart","Line Chart" and "Geo Chart". You can check visit count of each page, national distribution quantity of visitors and Line Chart for visit count during one certain time interval. It can display online users real-time. 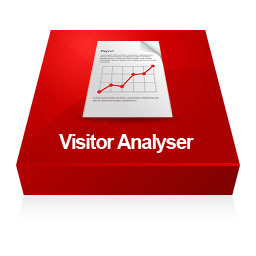 Admin can see which visitors are viewing your site currently through backend of this module. You can check record of each visitor's visit including IP, name, Platform, Browser,Url Referrer, Country, Enter Date, Visit Page Count and so on info. Record which pages visitors had visited and how long he/she stayed on each page. Besides, it can also record when this visitor entered and left this page, state of login and logout. You can configure to save data within how many days and expired data will be deleted. If it's configured to 0, then data won't be deleted. One standard edition license can only be used in one portal. Before you purchase it, please download trial version and play with it in order to know if it can meet your need. After you purchase this module, I won't give refund if there isn't any bug which I can't resolve. If you have any question or suggestion as well as requesting technical support, you can send email to [email protected] I look forward to your emails.